What Does It Mean To Be Asian-Australian? Growing up, I was always confused about what the term “Asian-Australian” meant, and today I still find it hard to define the term succinctly in a single sentence. Why? Firstly, the word “Australian” itself is a complex term. It fundamentally refers to someone who has Australian citizenship as outlined on a piece of paper. When we call someone “Australian” or “Aussie”, we usually (rather stereotypically) refer to one who loves meat pies, Aussie Rules football, speaks with a plethora of Australian ockerisms and never hesitates to have a drink to wind-down the week. Being “Australian” has also come to mean giving everyone a “fair go”, encouraging individualism and having a relaxed outlook on life. 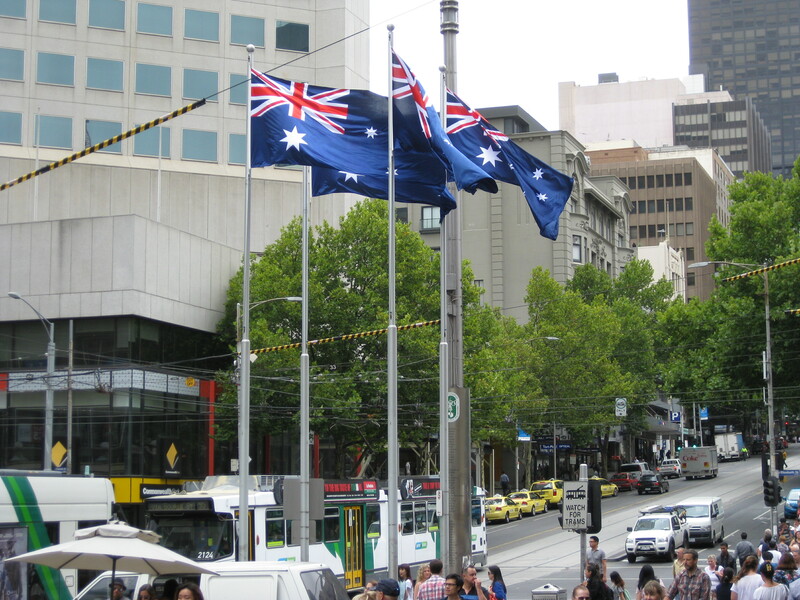 The Australian flag(s) flies high in Melbourne’s Bourke Street. What does being Australian mean, and what does being Asian-Australian mean? Photo by Mabel Kwong. Secondly, the word “Asian” itself is also a complex term. When we describe someone as “Asian”, we often (rather stereotypically) think of one who speaks fluently in their mother tongue, speaks broken English, is bad at sports and is extremely studious or hardworking for no good reason. Being “Asian” also means adopting a fairly conservative way of life, appreciating team membership and respecting tradition heaps. As such, the concepts “Australian” and “Asian” embody contrasting ideals, albeit stereotypical. Joining both words together into one, it is not surprising to see why it is hard to pinpoint a precise explanation of the term “Asian-Australian”. For an Asian-Australian like me (born and bred in Australia for more than half my life), interacting with one’s surroundings, feelings and experiences in Australia on a day-to-day basis influences how one defines being Asian-Australian. At the same time, one’s surroundings also defines how the Asian individual in Australia perceives being Asian-Australian. Based on my personal experiences and from countless conversations with fellow Asian-Australian friends and acquaintances, I have come to realise some of the emphatic qualities and feelings that are part and parcel of being Asian-Australian are: confusion, different, accepted. Confusion is always felt by the Asian-Australian especially while growing up and in the context of learning and constructing one’s sense of self Down Under. A study by Monash University found South Asian Australians are no strangers to pluralistic identification – they possess a sense of pride towards their own ethnic culture (cultural practices, language) while feeling Australianness through the ability to integrate into mainstream society (socialising with local residents). There is always the need to grapple and transition between one’s Asian identity and Western-Australian values as an Asian-Australian, and occasionally one might feel like a two-faced person. When I was a kid, I always loved playing sports under the sun like any other Caucasian classmate but immediately after I would sort of feel guilty for not listening to mum nagging at me to stay under the shade or else I would get “all black and ugly”. I love eating lamingtons but not Chinese pork dishes. I do not get and am not a fan of the “drinking culture” in Australia where almost every celebration or outing is accompanied by some form of alcoholic beverage. Having dual identities is a significant aspect of being Asian-Australian and it has the potential of instigating one into feeling confused. I often wonder whether I am more ‘yellow’ or more ‘white’. It would not be too surprising if Asian-Australians ask themselves ‘Who am I?’ at some point too. Going hand-in-hand with the notion of confusion is the idea of difference. Being different in the Asian-Australian sense can be a barrier towards interacting with certain people. Many Asian-Australians living in Australia are different in terms of looks and cultural background from their Caucasian-Australian counterparts and not everyone welcomes this “difference”. Once when I walked into a shop, I politely greeted the salesman staring at me with a simple “Hi”, and he offered a weak smile and let me on my way exploring the store. A few seconds later, an Anglo-Saxon mail customer walked in towards the salesman saying, “Hey mate”. The salesperson was all too eager to help him with a cheery smile on his face. Why was I virtually ignored? I am not sure, but maybe it was because I did not speak like an “Aussie”. Asian-Australians and/or Asian people also have the tendency to ostricise one another as well. I was wandering around South Melbourne a few months ago and this Asian salesperson stopped me, encouraging me to sign up to a rewards card in a Singaporean-Malaysian accent. Three times in five minutes I was interrogated: “Where are you from?”. Maybe this is because I do not have the Australian accent. Maybe this was because I did not say, “G’day mate”. It is always extremely hard to answer “Where are you from?” truthfully. For one, although an Asian-Australian is born in Australia and calls the country home, there is no denying that he/she has roots and descendents in the motherland. In other words, an Asian-Australian will always be somehow connected to another place other than Australia. For the Asian-Australian, you really do not know how to answer “Where are you from?”, and you don’t want to as it makes you feel all the more different if you do. For an Australian citizen of Asian ethnicity, calling oneself Asian-Australian is in fact a vital step in accepting and acknowledging that the individual belongs Down Under, even though if one chooses to abide by Asian values over the Western mindset or vice-versa in some situations or thinks being Asian-Australian is a burden. And this is perfectly acceptable. According to Chinese-Cambodian Australian lawyer and author Alice Pung, not all Asian-Australians conform to the typical Asian stereotypes but they possess an “incredible diversity of experience of (their) lives…the struggles and achievements” and constitute part of Australian narratives. No two people of the same race are the same. Not every Caucasian Australian takes an interest in Aussie Rules football or loves alcohol so much they get smashed every Saturday night. Likewise, not every Asian-Australian needs to be interested in Aussie Rules and drinking to be a true blue Aussie. Fact is, everyone has ups and downs and differences in life. Dwelling too much on the negative times or the insecurities one has about their ethnicity or nationality or even personality will not get you very far in integrating into Australian society. 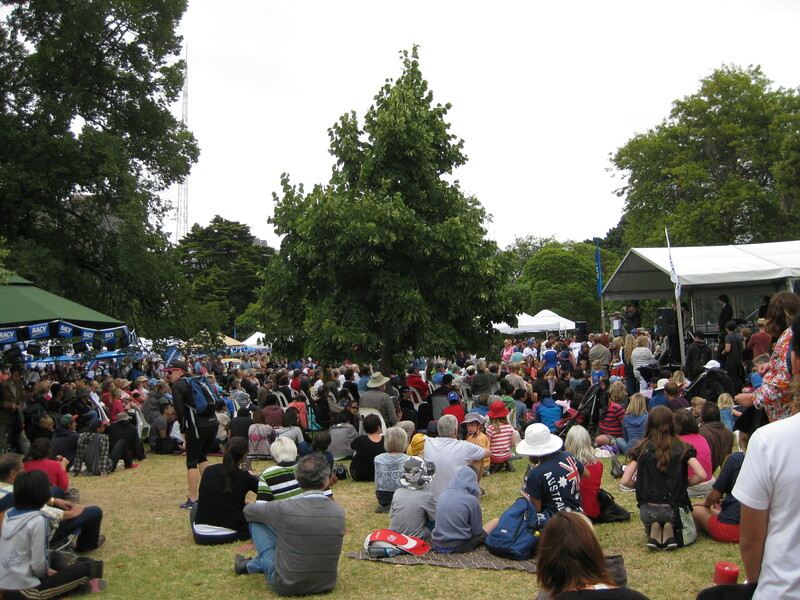 Australians of all backgrounds enjoying Australia Day festivities at Kings Domain. Being Aussie is about giving everyone a fair go and respecting everyone’s differences. Photo by Mabel Kwong. Personally, as an Asian-Australian, I am okay with being confused about my identity and being on the receiving end of occasional racism. It gives me something to think about when I am bored – I think of why certain cultures are the way they are and why racism is a common phenomenon. As an Asian-Australian, I rarely draw attention to my ethnicity or background in conversations and activities; I prefer to let my actions and ideas do the talking – and define me as a person. Perhaps that is why I have friends of all races, Caucasians and Asians alike, here in Australia today. Walking around Melbourne today, Asian faces are a common sight: Asian-Australians working hard at fast-food outlets. Asian-Australians playing their instruments together with hundreds of other musicians in a state symphony orchestra. The occasional Asian-Australian beside Anglo-Saxon Australians on television cooking shows. Asian-Australians yapping in their Asian-Australian accents, just chilling and hanging out with their fellow Caucasian Australian friends at the beach on a sunny summer weekend with no animosity between one another. In other words, many Asians have established their livelihoods and blended in very nicely here in multicultural Australia. They belong here. And they are Australian. It is important to remember that Australia is a nation that is made up considerably of immigrants, people of contrasting beliefs, religions and perspectives. It was recently reported in local media that Australia is “a nation of diversity and all the contradictions that go with it”. For a harmonious multicultural Australia to exist, Australians need to respect, tolerate and learn from each other’s differences as well as embrace everyone’s strengths. In short, being Asian-Australian can supposedly be condensed into a few phrases: being whoever you want to be as an Australian citizen. Recognising both Asian and Australian values and traditions. Giving everyone a fair go and treating everyone equally. Acknowledging that you are of ethnic background and you rightfully belong in a diverse Australia – a multicultural Australia. What Does It Mean To Be An Asian Australian Writer And Artist? This entry was posted in Asian, Asian Australian, Australia, Identity, Multiculturalism, Racism and tagged Accepted, Asian, Asian Australian, Australian, community, Confusion, culture, Different, identity, lifestyle, multiculturalism, opinion, Self by Mabel Kwong. Bookmark the permalink. I’ve never really thought of Australia as an Eastern nation, and am quite surprised that you suggested this 😀 I suppose there are very definitive meanings for being “Asian” and being “Western”. But in a world where new ideas always arises and culture is rapidly evolving, nationality or being “Australian” is hard to define. I hope china takes Australia over, China and Germany the only two countries in the world with any brains. We are too far away from Germany, so I’m voting for China. And I’m Australian!! In my opinion, I reckon China has overtaken Australia in the context of education. With such rigorous school curriculum in China, it’s no surprise the Chinese have far superior arithmetic skills than Australians. The Chinese are also known to work harder than Westerners as well (no offense to you or any other Caucasians. You’re not all like that!). 12 hour work days are common in the corporate world here and in Hong Kong. When you pull an all-nighter at work here, no one hardly baulks at this decision – it’s sort of expected in such a dog-eat-dog yet working-hard-culture world in Asia. In Australia, everyone rushes for the door at 5pm. Working hard gets us far socially, culturally and economically – new developments and ideas are generated to improve our livelihoods. Perhaps Australia should learn a thing or two from Asian cultures if it wants to avoid lagging behind other nations in various aspects. I guess that makes two of us and you are not alone, Joshua 🙂 For quite a long time in Melbourne, when people asked me where I’m from, I said “Singapore” or “Malaysia” depending on my mood, never “Australia”. But like you, I knew deep down that either answer was not correct. I would silently think after answering people, “Why am I from Singapore since I’m not born there? I speak Singlish, though”. I still don’t know how to answer this question today to be honest; acknowledging one’s identity and one’s home can be two different things. At least for me. Might write a post on this question. A lot of times, people associate the notions of belonging and home with where one is born or their motherland. However, so many people are on the move these days and slowly this traditional idea is beginning to change, and being Asian Australian or Asian American etc. or people who don’t fit stereotypes and surprise is more acceptable. The more foreign we feel, I reckon the more foreign we actually seem to others – it shows a lack of confidence in oneself. So I think accepting who we are is the first step, a major step, in making peace with ourselves and feeling a sense of belonging in world where no two people are the same. I agree with you. The more foreign we feel, the more foreign we’ll seem to others. Because ultimately, our innate fears are embodied and are translated into outright behaviour which influences how others see us. But, I guess acceptance that the self is different is only one part of the story. Having not been brought up in Australia, I find accent and differences in popular culture to be a barrier in communication. You become self-conscious that both of you don’t get each other at first instance. Sentences become peppered and truncated with many a “sorry?” and “pardon?” You never really can ‘click’, which makes conversations pretty superficial, going little further than your basic niceties – how are you? Accepting that we’re different is simply not enough, although that is definitely an important factor. I think you should write a post on the relationship between identity and home. I would definitely like to read your thoughts on it:) Although distinctions can be made between both, they are not mutually exclusive. Home is a normative construct which, I think, denotes an environment which carries intimacy and familiarity. It is a social milieu where personal identities are developed, where we discover how we are placed in the world. It is thus unsurprising that people like us will encounter identity confusions because “home” is a big part of “identity” and “home” is a pretty amorphous concept at the moment.. But maybe I’m looking at this whole issue wrongly. Maybe my stresses stem from the need to conform and to assimilate. Beyond Asian-Australians, there are many other ethnic enclaves (Greeks and Pakistanis to name a few) in Australia which are happy to be Australian, but not conform to the overarching and hegemonic norms of being “Australian”. After all, isn’t that what cultural pluralism means? Yet, there’s wisdom still in the axiom “when in Rome, do as Romans do”. Haha this is something I need to figure out.. But, thanks anyway! So true. Sometimes for Asian Australians who have grown up predominantly in a place other than Australia, mixing with locals is always a challenge. As you put it, we never really “click” with locals. It could be something to do with non-Aussie accented speech. Some locals may take time to process what they hear, so there’s uncomfortable silences between such two people and making it hard to progress a conversation beyond the greeting formalities and “The weather’s nice today”. There’s always several perspectives to an issue, and different opinions make the discussion all the more richer. It’s funny how more “white” or “less dark” ethnic groups are more readily perceived as Australians than others. For example, we have the Italian community in Melbourne, many of them proud to call themselves Australians yet still loudly speak Italian in Italian accents and make pizzas locals love – and locals generally like Italians. On the other hand, I see a lot of Asians who come here adopt and Anglo name and attempt to change their accents to a more Aussie-sounding one. No two people of the same race are the same. You hit the nail on the head when you say Australia is a mixed pool of migrants. Walk down the main city of Melbourne or Sydney and you’ll see Koreans, Indians, Greeks, Italians, Sudanese and so on and so forth. It’s not just a common sight, but an everyday sight. Though this sight is kind of rare in some of Australia’s outer suburbs that are still regarded as places where predominantly Anglo-Australians live. I think a lot of the time, migrants are comfortable with living in a place where food, entertainment and basic necessities are easily accessible especially within the first few years of settling in their host country – for safety and convenience sake to ensure a comfortable settling down here. Maybe this is why many of them gravitate to living in big cities in foreign places. Melbourne and Sydney do sound and look like New York with so many different races walking around. There’s even a hot dog shop near one of the main train stations in Melbourne – it’s very popular! LOL What IS it with the hot dog stands? One of my new readers was dying to try a NY hotdog on the visit she’s planning. Upon probing, I learned she knew of them from TV; LOL the dog stands are in every scene she figured they were good!! Yeah, what is it with hot dog stands? Well, hot dogs are fast food. And so many of us like fast-food. Unfortunately. But I’m sure they taste good! Pretty much agree 100% with all the comments above. However, it’s about time Australia started transitioning into a truly multicultural society based on the sharing of cultures considered of equal standing, instead of people from different cultures simply coexisting in the same geographic area. I hope so too. We can only gain so much from sticking to our own communities. But, that is much easier said than done. We have to learn to see that other cultures don’t wholly threaten us, which seems to be the case with Australia (think on the job market, housing front). Rather, there is a lot to gain from mingling with others of a different race.